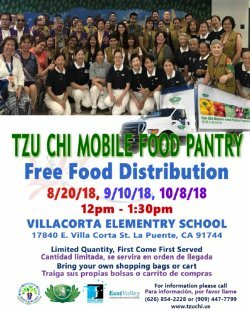 The Mobile Food Pantry will take place on Monday, December 10 from 12 to 1:30 p.m. at Villacorta Elementary School, located at 17840 E. Villacorta Street in La Puente. Please bring your own shopping bags or cart. Food will be given on a first-come, first-served basis. The next Mobile Food Distribution will be on Monday, January 14 at Villacorta.